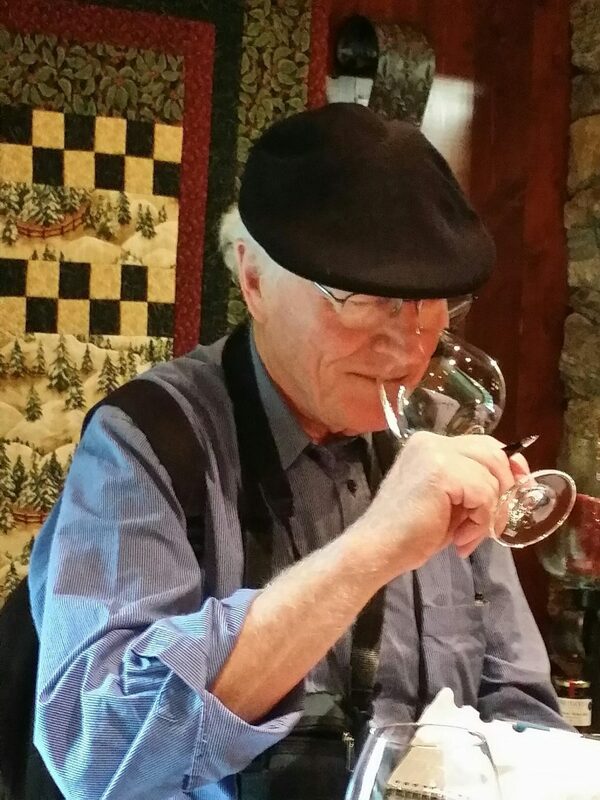 Wine writer John Schreiner. Photo provided by author. How many of us have taken a trip to the Okanagan with John Schreiner’s Okanagan Wine Tour Guide? I wondered. My first trip to our local wine region was with that book in hand, as recommended to me by another who took their first trip with it. Sitting across from him in a downtown Vancouver lobby to talk about his newest book, Icon: Flagship Wines from British Columbia’s Best Wineries, John is as engaging as he is in his writing. Full of anecdotes and generous in his praise. And because his bio states that he is Canada’s most prolific writer of books on wine, it must be asked: Just how many is that? Including the various editions of that first book with which I was introduced to his writing and the wines of BC? The revisions of that first book are telling of how quickly the British Columbia wine industry has evolved, how dynamic it’s become. “It’s moved from utter and complete mediocrity in the early eighties to producing world-class wines,” says Schreiner. Most of the improvement has been in the last 20 years, says Schreiner. Appropriate vines planted in the nineties are now settled in and mature. The valley is full of professional viticulturists. And the wineries are all now very well-equipped. As with any other wine region in the world, improved technology and acquired knowledge of the region when applied to the wines show in their expression. Today in BC, you’ll be struck more by the amphorae, concrete fermenters, and indigenous yeasts employed in an increasing number of wineries, which too has ballooned from a mere 17 in 1990 to over 255 (as of January 2016). Call them natural wines, skin-contact wines, or orange wines, these are the newest hitting the Okanagan Valley, alongside the more established Bordeaux Blends, evolving Pinot Noirs, and standout Rieslings. “Most wines in the world are made from the same ten grape varieties, but there’s lots of experimentation in BC,” says Schreiner. Indeed, there are now over 60 different grape varieties being grown in British Columbia, according to the BC Wine Institute. As diverse as the grapes grown in BC to make wine, so too is the wide range of styles and types of wines. It’s a diversity that can confound the visiting wine writer in describing our wines; placing wines in comparison to other more established regions that are known for a particular wine style or use of grape variety is the easiest way to describe those from newer wine regions. But if one thing is clear, it’s that British Columbia wine has hit its stride. No longer on the edge of obscurity, it is now a region from which to buy wine, to enjoy and take pleasure in — particularly as you take in the gorgeous scenery and delicious restaurants on site. I ask John, who’s led a double life as a business reporter and a wine writer, if his newest book is an illustration of BC’s arrival on the world wine scene. If its evolution has now come to a point that we can think of cellaring our relatively young wine region’s wines. The wines he highlights in Icon don’t include all the best wines in BC, says Schreiner. Some of the newest yet stellar wines weren’t included because they hadn’t yet proven their consistency for being so new. But the wines he does include are ones around which he suggests to build verticals, wines of different vintages. They range in price from $20 to over $100. As for our opinion on the book? The hard-cover, colour book is a must-have for the British Columbia wine lover or anyone wanting to learn more about this region. Each wine is accompanied by a colour image of the bottle so you can easily identify them on the store shelf. It’s a very well-laid out book. With his signature engaging and readable style, John introduces each winery with a backstory, and highlights wines with which to build verticals. Like his writing on his well-known and well-read blog on British Columbia wines, it’s an inclusive list, with almost a hundred wineries included. So, fair to say that not all the wines or wineries would be considered icon wines, nor iconic, which you might be led to believe with the word “Icon” in its title. Instead, think of them as collectible wines (which doesn’t make as great a title), wines to enjoy as they evolve with time. We like this approach for this book. It reflects the diversity of British Columbia wines. And with our genetic makeup, exposure to various aromas and flavours, and exposure to different wines — all dictating a vast range of sensitivities and visceral reactions to the many characteristics in wine among us wine lovers, it’s a better approach to enjoying more wine. Which corresponds to John’s personal view on wine.